Have parties with little ones and adults and want to be sure the kids don’t drink the Sangria by accident? I have the perfect craft for you. I saw some Pitcher Labels in my most recent Ballard Designs Magazine and for $15 I thought I can make those much cheaper…. These make amazing Hostess gifts, Birthday gifts, Teacher Appreciation gifts or Mother’s Day Gifts for your friends. You won’t believe how simple this Homemade mother’s Day craft or Hostess gift can be. I went to our local AC Moore for supplies and most I had at home. I bought some pre cut shapes they sell in the balsa wood section. You can also buy pine and cut them yourself but I don’t have a jigsaw. 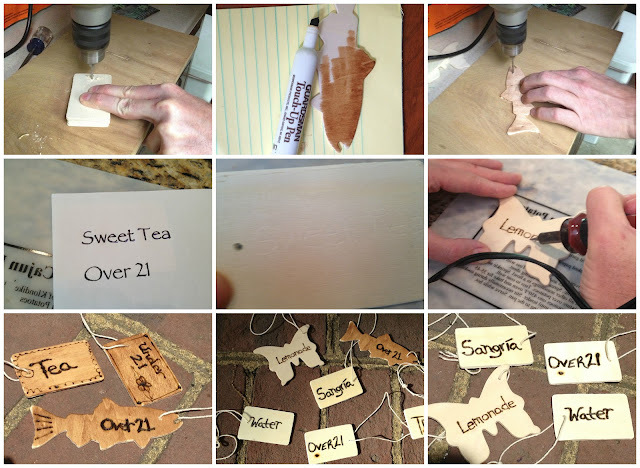 You can also use paint stirrer and cut them thinly. First drill a whole in your wood using a 7/34 bit. If you don’t want the natural color, I used touch up wood pens we had at the house. For the writing, you can use the Xyron machines or..
Jute would be ideal to use as tag holders but the store was sold out. Told you these were an easy DIY craft and did not cost much. I got a little crazy with the burning tool and decorated a few a little too much for my taste. 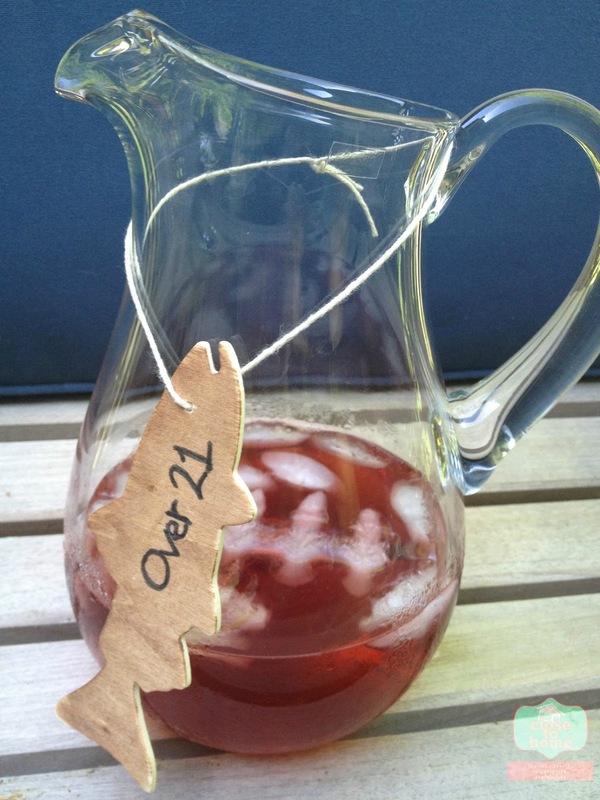 So next time you have a party, don’t worry about the kids getting into the adult punch or Aunt Millie getting the Caffeinated tea, identify your pitchers or bottles with these adorable labels. 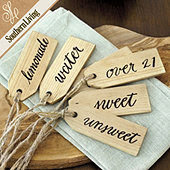 Make some for your next party you are attending, they make great hostess gifts. You can make them as feminine or masculine as you desire. I like the fish ones too. What labels will you make? I know they have so many different wood cut outs at craft stores these days and for under 50 cents that is a bargain. That’s really cleaver ans yep looks EZ!! That is so cute and looks really easy to make! Makes the pitcher look even nicer. That is a fantastic idea and very cute! 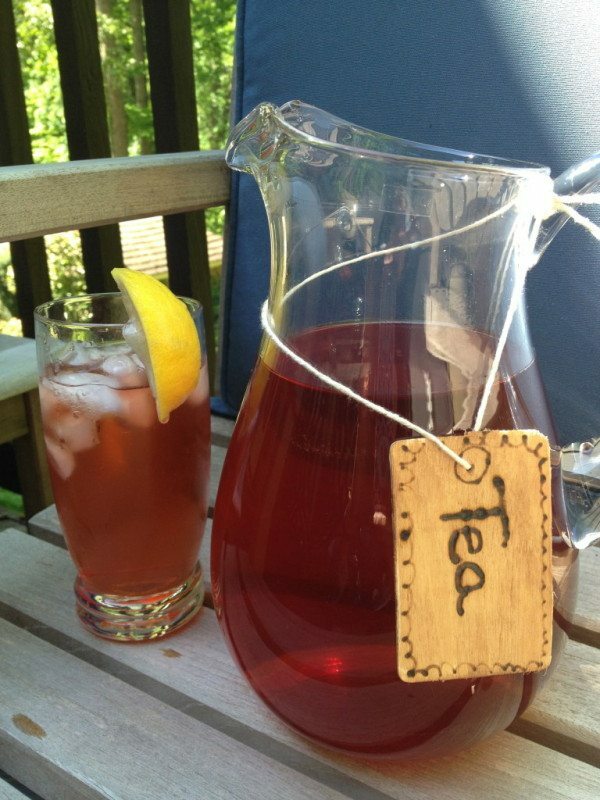 I’ll have to attempt making some of these to have on hand for summer BBQ’s! That is an awesome idea!I am going to have to make some of these. I love this! I think even I could manage to make these and I am craft-handicapped. Pinning this for future use! Those are gorgeous!! And they look quite easy to make…could even have the boys do it. What a fun and easy way to add your party theme to your existing servingware! Thanks so much for posting. Oh what a great idea! Looks so refreshiing. This even works for young kids as my three year olds at least know their letters. Love the personal touch. Thanks for the BlogLovin follow and linking up to my weekly hop (http://www.journeysofthezoo.com/search/label/BlogLovin%20Hop). This is a really cute idea! Now everyone will be able to tell what is what in our fridge! Somehow it also seems to make your writing stand out! Like you bought it at the store!